In October 2014, I had the rare opportunity to acquire one of the rarest head harnesses in existence. The Spalding No. 30 Head Harness, commonly referred to as the "Chicago Style Head Harness" was manufactured between 1901 and 1903 and ranks #3 in my Top 10 Rarest Football Head Harness Styles. While this head harness is remarkably rare, with fewer than ten examples likely to exist, its condition is even more astounding. The harness is "new old stock" (NOS), having never been sold or worn. In fact, the original price cost code (AXX) and price $3.00 were still written in pencil inside the helmet. 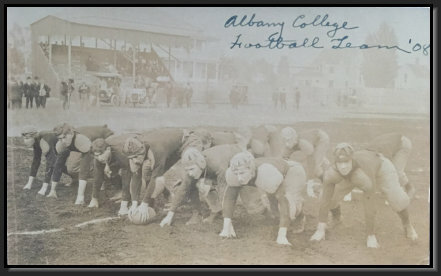 Normally football artifact provenance is limited to, "I found it at a pawn shop," or "It used to be my grandfather's," and even that information is typically lost as items are sold and resold over time. Fortunately for this head harness, the owner knew exactly where it had been for the past 112 years. William "Bill" Anderson grew up in Roseburg, Oregon, which is approximately 70 miles south of Eugene, Oregon. Influenced by his grandfather, a watchmaker, Bill entered the Elgin Watchmakers' College in Elgin, Illinois after graduating from high school in 1948. Upon returning to Oregon, Bill received a business degree from the University of Oregon. While raising five children with his wife, Bill worked for credit jewelry stores, had a stint as a home builder, and eventually operated his own jewelry store liquidation business. For 35 years, Bill conducted "Going Out of Business Sales" for stores in Idaho, Oregon, California, and Washington, while working on watches out of his home at night. In 1974, Bill learned that Palmer Brothers, a Baker, Oregon jewelry store, was closing. Like many western towns, Baker City, Oregon owes its founding to the nearby discovery of gold in the second half of the 19th century. First platted in 1864, the population of Baker City stood at 300 in 1870. By 1880 it had reached 1,200 and by 1890 it swelled to 2,600. New residents meant new opportunities for business enterprise. One aspiring businessman, a farmer named John Palmer, moved to Union County, Oregon from Delaware County, Pennsylvania in the late 1860's. John brought his wife, Almira, to Oregon and by 1870, the U.S. Census shows that their family had grown to include four sons and a daughter. John's occupation was listed as a retail grocer in 1870. George (b.1871) & Charles (b.1874) Palmer, were John and Almira's second and third sons. In the 1890's the two Palmer brothers opened a bicycle business in Baker City, Oregon in the rear of the J.B. Gardner jewelry store. In 1896, the Palmer brothers took over the J.B. Gardner space and a new "bicycle and jewelry business," Palmer Brothers, was born. As with most small town jewelry stores, Palmer Brothers sold a wide variety of goods, including clocks, watches, bicycles, firearms, silverware, glassware, and sporting goods. George and Charles also provided optician services for the residents of Baker City. Gold yields from mines and claims in the Baker Gold District reached $3 million in 1897 and Baker City quickly became one of the fastest growing cities west of the Mississippi. Palmer Brothers developed a great reputation with miners and speculators, who sold their gold to Palmer's; one of the few businesses with an account to resell it to the U.S. Treasury. As the gold miner's first stop in town, the brothers were in an ideal position to sell them a wide variety of goods. Between 1890 and 1900 the population of Baker City increased an incredible 155% to 6,600. In response, the Palmer brothers upgraded their business. According to Bill, in 1906 the Palmers moved the J.B. Gardner building into the roadway and conducted business from it while they constructed a new 2-story sandstone building in its place at 1801 Main Street. The Palmer brothers went on an aggressive advertising campaign, posting signs throughout the region within a 50-mile radius. The upgrades in merchandise and decor are evident when comparing the pre and post-1906 interior photos. Unfortunately, the boom didn't last. Gold claims and population growth slowed dramatically over the next 10 years and the Palmer brothers store made adjustments to their business. The brothers eventually exited the bicycle and sporting goods business and rented the rear of their building to Baker City's Indian motorcycle dealership in the 1920's. For nearly 50 years, the Palmer brothers were known as reliable and honest jewelers and opticians. By the 1940's the reins were handed to George Palmer's son, John. Charles died in 1938 and George passed away in 1945. John continued to run Palmer Brothers until 1974, when perhaps due to his own ill health, he decided to sell the business. John Palmer died less than one year later in January 1975. Photo of George & Charles Palmer inside the original Palmer Brothers jewelry store, Main & Valley Avenue, Baker City, Oregon. Circa 1900. Photo courtesy of Baker County (Oregon) Library Historic Photo Collection. Photo of Baker City from Palmer Brothers jewelry store. Circa 1900. Note Palmer Brothers bike spoke sign in foreground. Photo of Palmer Brothers store. Circa 1910. Photo of interior of Palmer Brothers store. Circa 1906-1910. On June 1, 1974, Bill Anderson was able to put a deal together with John Palmer and closed on the purchase of Palmer Brothers remaining inventory. Bill, who lived in Eugene, spent the next two months conducting a close out sale of the merchandise in the Palmer Brothers store. He sold the display cases and fixtures to a Eugene coin shop. Another gentleman from Eugene purchased the remaining bicycle and motorcycle parts. Some of the remaining items of historical significance were acquired for a museum. Bill was even able to sell the contents of the basement, which had served as a catch all for old inventory. As he went through the basement items he picked out several things to bring home and placed them in the building safe. By the end of July, with his job complete, Bill brought the contents of the safe and the remaining unsold items home, put them in his attic and left them there.......for 40 years. In 2014, Bill decided that the time had come to replace the roof on his house. While inspecting his attic he came across the old boxes stored there and began sifting through the contents. He came across a odd looking helmet, that most people would have overlooked. It's not particularly substantial and certainly doesn't look like a football helmet. In its mint condition it would be very hard to believe that it was made within the first three years of the 20th century. Bill however, was curious and employed the help of his grandson to research his new discovery on the internet. It wasn't long before he understood how truly rare a find he had made. Ultimately, Bill accepted bids on his Spalding Chicago Head Harness and it is now in my personal collection. Suffice it to say, Bill won't be dipping into his savings to pay for his new roof. Why did Bill decide to set aside and bring the helmet home back in 1974? According to Bill, "I'll never be able to tell you." Bill believes that the head harness was surplus stock from the original Palmer Brothers in the J.B. Gardner building and made the move to the new store in 1906. In 1903, the Intercollegiate Football Association banned the use of sole leather in head harnesses. As a result, it is likely that the Palmer brothers were unable to sell the Chicago head harness after obtaining it from Spalding. While Palmer Brothers continued to sell sporting goods from their new building, by 1906 newer models of head harnesses had replaced the Chicago head harness and it was likely placed in storage in the basement when the new store opened. Once in the basement, the helmet was lost in piles of old and current inventory until Bill discovered it while conducting the close out sale 68 years later. Palmer Brothers advertising sign, circa 1906.